Prior to joining the faculty at UDC, Professor Harris spent a year with the American Immigration Council focused on efforts to end the detention of immigrant families seeking protection in the United States, as part of the CARA Family Detention Pro Bono Project. As an Equal Justice Works Fellow and later a staff attorney, she launched and led the African Women’s Empowerment Project at the Tahirih Justice Center, conducting outreach to and representing survivors of gender-based violence in the DC metro area. Immediately following graduation from law school, Professor Harris clerked for the Honorable Harry Pregerson of the Ninth Circuit Court of Appeals. Professor Harris’ research examines the human outcomes of immigration laws and policies. 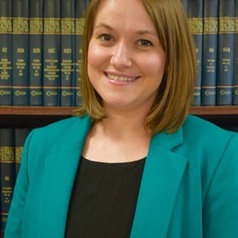 Her publications address contemporary issues in asylum law and policy, including gender-based and gang-related asylum claims. Professor Harris’ research frequently looks beyond the law, employing social science research methods to assess the efficacy of laws and policies, for example those designed to facilitate the integration of individuals granted asylum in the United States.